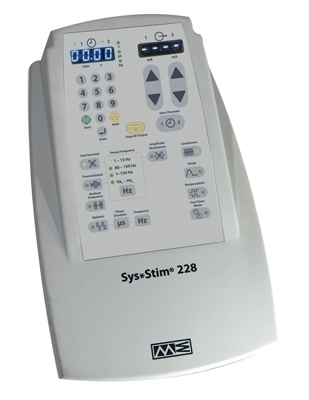 The Sys*Stim 228 neuromuscular stimulator has four discrete waveforms: Interferential, Premodulated, Medium Frequency (Russian) and Biphasic waveforms. In addition the clinician can set on/off times, pulse width and frequency along with frequency modulation for some of the waveforms. Dimensions: 12" x 7.4" x 8"